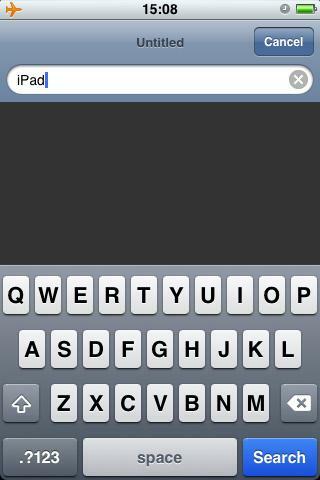 The "Google" button that appears on the soft keyboards of existing iPhones when conducting a Web search has been changed to simply read "Search" in the beta of iPhone OS 4, removing a reference to Apple's rival. The change was already made in iPhone OS 3.2 for the iPad, but the iPhone OS 4 beta for the iPhone shows that the subtle tweak, as discovered by iLounge, will likely make its way to Apple's handset when the software upgrade is released this summer. In the current iPhone OS 3.1.3, using Safari's search function offers a blue "Google" button in the bottom right corner of the touchscreen keyboard. This week it was also revealed that Apple added Web search to the Spotlight search feature in iPhone OS 4. That option also does not mention Google, only saying "Search Web." The small change to iPhone search could serve as more evidence to support claims from earlier this year that Apple and Microsoft have been in talks to make Bing the default search engine for the iPhone. Currently, searches conducted through the Safari Web browser go through Google by default, though Yahoo can also be selected. In March, The New York Times profiled the increasing rivalry —one that has reportedly become personal —between Google and Apple. The newspaper said that Apple co-founder Steve Jobs feels that Google "violated the alliance" it had with Apple when it released phones based on the Android mobile operating system. It was the introduction of Android, the Chrome browser, and Google's plans to release its own netbook operating system that forced Schmidt off of Apple's board of directors last August. Soon after that the two began competing for acquisitions.